I was contacted by the marketing manager of Xavian Loudspeakers (Italian design/manufactured in the Czech Republic) requesting an Audiophilia review of the ‘Perla Esclusiva’, a stand mounted monitor from Xavian’s Natura range of loudspeakers and the recent successor to the original Perla. We lost contact for some months after the initial request. Later, I was contacted informing me the newest iteration of the Perla was ready for review. The pair was shipped from the Czech Republic to the island in a solid, quality cardboard box (wrapped in cling film) with hard foam around the speakers ensuring safe passage. They arrived in pristine condition. I was told the speakers had some time on them and that 20 hours would be sufficient to complete the break in of the neoprene surrounds. The review was completed without the magnetic speaker grills. The small units (315 x 190 x 236mm) are deceptively heavy (7.7 kg each) and look striking. The Perla Esclusivas are made of solid Italian oak. A small, pearl-like bauble is affixed to the rear, above what look like very high quality, Xavian-marked, three-way binding posts. Visually, you are getting a lot for your money (from €1645/pair up to €2025/pair, depending on finish). Prices are in Euros, excluding VAT. Matching ‘Perla’ stands are €570/pair and would seem a perfect match for the excellent workmanship of the loudspeakers. I only received the speakers. As such, the units were placed on my standard metal Target stands. They acted as functionaries, no more. If purchasing these speakers, spring for the dedicated stands for the full visual impact. For a ballpark USD price at today’s exchange rate, for speakers, stands, VAT, and shipping, you’re looking at a smidge above $3,200. A remarkably good price for high quality monitors, stands, taxes and shipped to your door. The Perla Esclusiva has a 5 year warranty covering ‘quality of materials, functionality and finish’. A reminder that Xavian Loudspeakers and accessories are only available for purchase online from the company website (linked below). Order time from website click to ship? Two weeks. The Perla Esclusiva is from the ‘Natura’ Series of speakers, the penultimate series in the Xavian product line (priced accordingly, the series are Dolce Musica, Joy, Natura and top of the line Epica). Formed in 1996, Xavian is owned by Prague-based, Italian born designer Roberto Barletta. Engineer David Hyka joined Xavian in 2011 as the company grew and began shipping speakers worldwide. 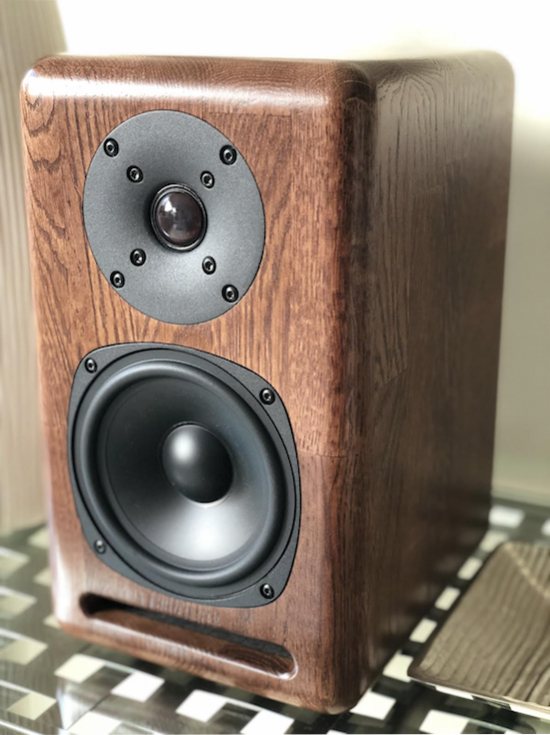 Barletta still has final sign off on every Xavian speaker, and until recently, hand assembled and designed all cabinets, crossovers and drivers. The Perla Esclusiva is a compact, two-way loudspeaker with a bass-reflex vent on the lower front. The cabinet is made of solid Italian walnut with, what Barletta calls, a ‘mosaic’ structure. No use of MDF or DTD, and the wood rests for 3 weeks before use. The Perlas sounded best slightly toed in about 10 degrees with tweeters at seated ear level. I tried them firing straight out into my music room, my preferred visual, but like my previous reference, the Raidho Acoustics XT-1 and present Alta Audio Celesta FRM-2s (both stand mounts), the Perlas image better with a toe in. I played them for a week listening casually. I was surprised at the quality sound out of the box, but they did loosen up considerably after a week of Solti’s pounding Le Sacre. The result was a clearer midrange and better bass response. I think you’ll be very impressed initially, especially their dynamic nature, but give them some time. Typical of well designed monitors, a sense of immediacy imbued every genre played. Not in your face, simply, outstanding imaging and forward presence. The sound stage was excellent, and improved if fired straight out—but then the speaker’s superb imaging suffered. I went for the tighter image and paid little or no mind to the slightly tapered soundstage width. The final position made for a satisfying congruence of both drivers. The numbers for frequency response, impedance and sensitivity are all in a monitor’s sweet spot, but damn, the Perla’s can play loudly without strain. My music room is quite small (14 x 12) and the Perlas thrived in it. However, even larger rooms would not inhibit the little guys. My Jeff Rowland Continuum S2 has 400 watts a side, and though the amplification suggestions for the Perlas are in the 30 to 120 W range, they had no problem handling more power. Some of the more thorny textures and wall of sound waves in Solti’s Le Sacre posed no problems for the Xavians. Once or twice, I reached for the remote in the First Part of the Stravinsky, just in case. The physics and engineering of the loudspeaker will not allow ear bleeding levels, and why would you want to with a refined monitor such as the Perla? But, they will give you some vicarious thrills, even for headbangers. I felt they could play much louder than my ProAc Tablette Signatures and could match them and Harbeth’s very refined P3ESR loudspeaker in musical delivery—absolutely lovely midrange, sweet treble and surprising bass response. For the price, the Perlas could not match my Raidho Acoustics XT-1 at $9,000 (with proprietary stands) in clarity or refinement of instrumental timbre. The Raidho drivers are unique, exceptional and exceptionally expensive. With quality electronics, I’ve heard them take on most comers, even much more expensive examples. Yet, for a 6K discount, the Perlas will give you a lot of what the Raidhos have to offer. The new finish ‘Marina’—a luxury finish of light maple with walnut insert (with Perla stands). The speaker’s immediacy was wonderful on intimate vocals such as Frank singing Only the Lonely or Shelby Lynne’s Just a Little Lovin’. These speakers have a delightful way with vocals—a real affection and understanding on how to deliver the sound of a human voice. My bass testers, Thomas Newman’s Dead Again from American Beauty and the opening of Esa Pekka Salonen’s live DG recording of Le Sacre du Printemps, passed with flying colours, but at reasonable levels. The bass drum and two tubas solo note in the first half (a bar before rehearsal 22) of Le Sacre can wreak havoc and is the only note to clip my 400 W Rowland through my Altas! But played at exciting levels, no problem. In fact, very impressive. I know the ProAc and Harbeth cannot replicate the solo quite like the Xavians. The bass reflex slot performed as designed. No chuffing heard. A magic box. There are a lot of monitors vying for your dollar (or euro). Models from Magico and Raidho Acoustics can cost $25,000 and above. They are exceptional and are some of the world’s best loudspeakers, no matter the size or topology. My Altas are $15,000 and play well above their price. Comps to the Perlas are the models I mentioned and other fine speakers from a myriad of companies. For refinement out of a $2500 to $3000 box, not much beats Brits ProAc or Harbeth. But the Perla Esclusivas matched them in instrumental refinement and topped them in immediacy, vocal presence, and ability to play loudly. For your money, you’ll get a beautifully made, exceptional sounding speaker that’ll impress you and your friends, and will give much musical pleasure. Very highly recommended.